From downloading the Starling Bank app from the App Store, to having an account verified, and ready to go, took us around two minutes. Snap a photo of your ID, record a short video to verify your identity: "My name is John Smith and I'm a Starling Bank customer", and you’re in. No branch visit, nothing to sign, no sending off of passports. Again, they’ve made it exceptionally easy to get some funds into your Starling Bank account right away...a pretty good idea for a new bank! If your phone is registered with Apple Pay, money can be transferred to your new Starling account with just a fingerprint. They’re not so subtle with “why not request your salary paid directly into your new account”, which will be for many, the final part of making a full switch from their current bank account provider. Switching via the Current Account Switch service is in-app from day one, and you can imagine they’ll be pushing as many people to go via this route as possible. Finally, there’s the option of funding the account via a debit card (by taking a photo, of course) for those without the above options. All things considered, it couldn’t be much easier to get money into your account. Our card arrived within 2 days of opening the account which is a fairly impressive turnaround, though at present there’s not a lot to do with the app until the card is received. In a rush to get the app live, there’s no Apple Pay on launch which doesn’t quite fit with the tech angle, but we’re promised it’s coming very soon. What you can do while waiting for a card is set a custom PIN from within the app, which is such a simple but obvious idea. When the card does arrive - there’s no formal letter, separate post containing a PIN, or a pile of terms and condition documents, just really slick packaging with a slide out contactless card. The notification whenever the card is used is a nice enough feature, but we've seen it better elsewhere, such as on Monzo, with their quirky use of emojis. This is where Starling will hope to shine against the competition. By offering some intelligence as to where money is being spent, they can try to help their users budget better. This view is currently basic, but we imagine that it will become more intelligent, complex, and genuinely useful as the app matures. The “home” screen gives a pretty breakdown of where the day's spending has gone, and is a much more interesting transaction view than the standard "spreadsheet view" we've become used to in similar banking apps. Overdrafts will be available shortly after registering, with charges for dipping in and out set at clear costs. Here Starling Bank are promising clarity, and transparent charges with a fixed percentage. Aside from this, it doesn't look like there'll be any monthly fee attached to being a Starling customer. 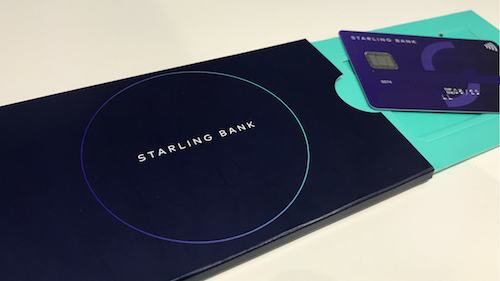 One of the things which all challenger banks, not just Starling Bank have to prove, is that while their business may be lighter and more cost effective than a heavyweight like HSBC, outside of a slick on-boarding and a simple, functional app, the life improvement element that is much heralded remains to be seen. Trying to persuade customers to switch current accounts because “we have a shiny app” isn’t likely to be motivation enough for Joe Bloggs in sunny Sunderland. Stats published last year showed that 25% of UK consumers still hadn't heard of the Current Account Switching Service, never mind to ready to jump ship to a bank they've not heard of. So at this point, it does what it says on the tin, but there’s not quite a killer reason to encourage your mates down the pub to make the switch, other than to be an early adopter. So what's the killer feature? There is a bold vision behind this bank. They don't want to sell you every financial product imaginable, but rather, aim to focus on building a truly amazing current account. Starling Bank looks set to make its money via product recommendations (its marketplace), though it’s not clear to see where they’ll fit in (unobtrusively) just yet. Given the spending analysis, one can imagine how easily “you spent £622 on car insurance last year” can be spun into “here's a top-rated car insurer for less than £500" come renewal time. We’d love to know what you think of this very new challenger bank. So if you’ve downloaded the first version of the Starling Bank app, and whether you love it, don’t really see the innovation just yet, or are indifferent, let us know by leaving a review. Will Starling Bank leap into our British Bank Awards league table next year, or will adoption be slow? As with all reviews on Smart Money People, your comments will help other people who are looking to make the plunge make up their minds!